You all loved our first #tbt last week so here’s another of our proposal we created for our TV show on Sky Lifetime…we’re looking back at Angelo & Chiaras magical boating lake proposal!! This proposal is still, and will always be one of our favourite proposals ever! With just a week to go (like so many of you men out there) Angelo came to seek our help. The Proposers, knowing that he wanted to do something outside and something both himself and his partner Chiara had never done before, got to brainstorming! It wasn’t long until we had a lightbulb moment…rowing on a private lake ticked all his boxes! Chiara receiving her favourite flowers. 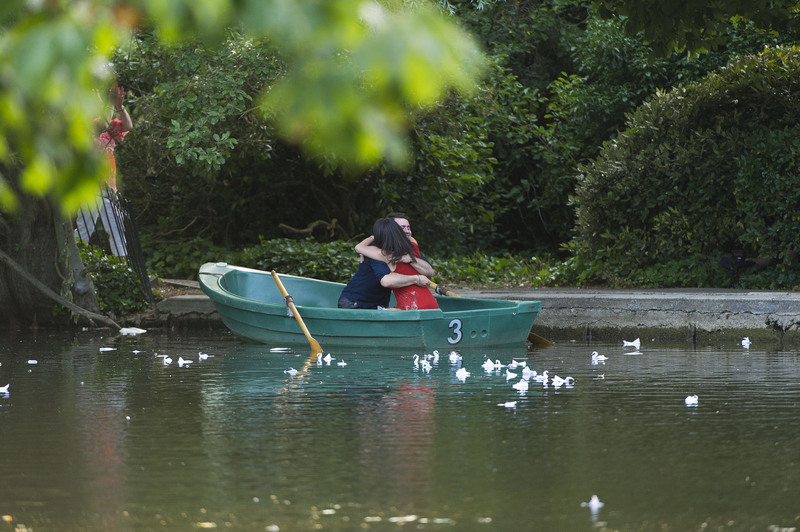 So The Proposers, hired out a private lake in the middle of summer (in the middle of London), to create one of the most intimate proposals ever. As they rowed around, we surprised the couple with things we knew they loved. Firstly, Chiara received a beautiful bouquets of white roses, followed by her favourite Cosmopolitans. Then the couple were serenaded by a by-passing singer, which gave us the perfect moment to recreate the swan scene from The Notebook – of course we couldn’t hire hundreds of real swans, so we did the next best thing and made thousands of origami swans. Whilst Angelo and Chiara floated through the birds, family and friends (who we had hiding in the surrounding bushes) appeared holding signs saying Chiara, Will You Marry Me? This beautiful moment was topped off when Angelo gave the most amazing speech – we still have a tear! This proposal had everything (we were and still are super jealous); friends, family and fun, but ultimately it was meaningful and completely tailored to both Angelo and Chiaras likes and loves and we couldn’t be happier! If you’re interesting in creating a perfectly personalised and unique proposal, then get in touch; we’re the proposal experts and have created over 500 successful YESâ€™ – so whats stopping you? We’d love you forever if you can take a second and vote for us to win The Romantics here…you could even win a free holiday, a Virgin Balloon Flight, £100 Figleaves vouchers and much much more!!! !